We accept USD, MXN, CC or Paypal. Pay cash and avoid a 2% credit card fee! New reservations require a 50% initial payment to book your reservation. The balance may be paid in cash, credit card (Visa and Mastercard), or via PayPal at the end of your stay. Cancelations - If you have to cancel your reservations, please do so within 60 days of your arrival or you may forfeit your initial payment. Includes; breakfast, lunch, use of kayaks, bikes, pool, jacuzzi, snorkeling gear, and beach support. 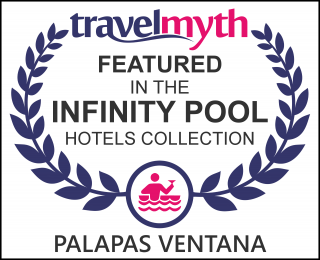 The Palapas Ventana Restaurant was built in the same style as our casitas, with palapa roof and patio. It sets on the east tip of our property and overlooks Cerralvo Island, the Sea of Cortez, and all the kiting and sailing action. We offer the finest Mexican/American cuisine. Besides a moderate sized dining room and large patio, we have a bar, a ping pong room, and internet café. We serve breakfast, lunch and dinner to our guests and are open to the public 7 days a week. Enjoy fresh squeezed orange juice or a coffee from our espresso bar all day or cool down with a variety of cold beers, wine or a variety of flavored margaritas. The pool is open daily from 10am-9pm for hotel guests. We operate the jacuzzi after 6pm. Please ask in the restaurant for assistance. Use of masks, snorkels, fins, and wetsuits is free for all hotel guests. Kayaks are on the beach and are free for hotel guests. SUPs are available for rent at a special rate for hotel guests ($20.00 USD/day or $40.00 USD for your entire stay). Rent a car at the airport for independence and side trips or we'll arrange a shuttle for you. Get your car from Budget in La Paz or Los Cabos and get a 5th day free when you pay for 4 by giving them the promotional code "palapas" click link for website or call Budget from USA or Canada at 1-866-496-2880. 3 full days, 2 tanks per person - plus snorkeling and exploring the beaches of Cerralvo Island. Scuba Certification Package (3 Person minimum) - $975.00 USD Flat rate. (Drinks and tips not included.) For groups of 3 or more. Breakfast and lunch everyday you are at Palapas Ventana. Use of kayaks, pool, jacuzzi and snorkeling gear. Local Coast Snorkeling Excursion - Includes lunch, all gear - $65.00 USD per person per day (minimum 2 people). Night Snorkel - Includes flashlight, cyalume, and all gear - $75 USD per person (minimum 2 people). Local Coast SCUBA Excursion from shore - $110.00USD per person - Includes 1 tank, lunch, Dive Master and all gear. Night SCUBA Dive from shore - $110.00 USD per person - Includes 1 tank, flashlight, cyalume, divemaster/guide, and all gear (minimum 2 people). Discover SCUBA from PV shore - $130.00 USD per person. Includes transportation to dive sites, and all equipment. PADI Open Water SCUBA Cert. - $650.00 USD per person (2 or more) or $750 (solo class). Includes transportation to dive sites, manuals if necessary, and all equipment. SCUBA Review from shore - $110.00 USD per person. Includes all equipment. See our package pricing for group discounts or contact us for a custom package. Long term stay discounts are available for 2 or more weeks. Discounts for kids under 8.